When in Okinawa, you’ll notice that most places that serve beer, is going to serve Orion beer. Draft choices are limited to that. It was rare to see Kirin or Sapporo. 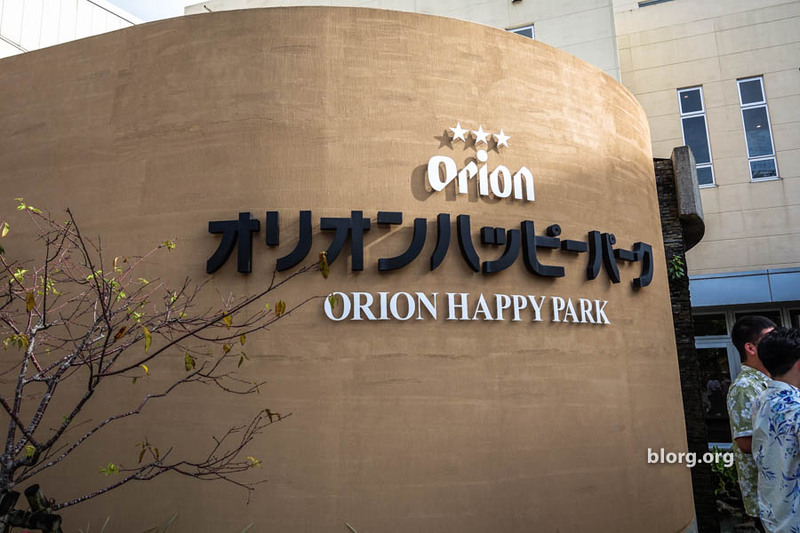 As a beer connoisseur (very polite version of saying alcoholic), I thought I’d take this opportunity to visit the Orion brewery (Orion Happy Park). The Orion beer factory is 1 hour by car from Naha City and 2 hours by public transportation. It is far from the city and difficult to navigate to on your own. If you’re looking up things to do in Okinawa, you might as well do this part of a set tour. That’s exactly what I did. My set tour included the Okinawa Aquarium, Orion Happy Park, Okinawan lunch, Pineapple Park (more like Pineapple Gift Shop), and dinner at the oldest restaurant in Okinawa. Having the set tour is nice just because driving around Okinawa is a hassle. Free! They also provide 2 beers and a small bag of beer nuts at the end. The tour is only in Japanese. If you go to the official Orion website you’ll find that the website is only in Japanese too. But, you’re still welcome to go. You’ll need to schedule in advance for the tour. We had a tour guide that translated the tour for us…pretty awesome. Much like any other beer factory tour, they’ll start off with the history of beer then walk you through the process. After the tour, the beer tasting started. They pretty much just had Orion Beer and an Orion Cider. If you’ve taken the tour, they provide you with 2 draft beers or 1 cider/non-alcoholic drink. Along with that they provided you with a bag of tasty beer nuts. Of course, the gift shop is right at the entrance/exit. They want you a little drunk so you’re more impulsive to make a purchase. Classic beer marketing.